Now that Memorial Day is behind us, it means summer is officially here! Yay! It may not technically be summer, if we want to be super accurate, but for all intents and purposes, it’s summer. Beaches are open, the weather is beautiful, and barbecues are starting to become a staple feature of our weekend plans. I love summer barbecues more than anything- I think they may actually be one of my favorite things about the season! There’s something so nice and relaxing about getting to eat outside in the sun with good company and good food. My family typically has an asado style cookout every weekend. Sometimes it’s with all of our family and friends and other times it’s just my parents and my sister. Regardless of how many people are present, barbecue, grilling, and asados happen every weekend, and I wouldn’t have it any other way. I love being able to eat outside in the summer. It’s so relaxing and at the same time feels extra special, since we only get a limited time to enjoy eating outside (if you live somewhere where you can do this year-round, I’m jealous!). Sitting in the sun for several hours requires a delicious and refreshing drink, so with barbecue season officially starting, I figured I had to come up with my own. I love iced tea and strawberry lemonade, so I decided to create an Arnold Palmer style drink with some strawberry syrup for extra flavor and some seltzer water to make the drink extra light and refreshing. I loved the way this drink turned out. 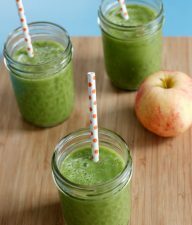 It’s light and refreshing, full of flavor, and so simple to make. Since all the ingredients should be chilled before you mix them together, it means that you can prepare all the components in advance and simply mix them together just before you’re ready to serve the drink, making it a great option if you’re hosting a summer barbecue. While I loved the drink, I personally found it a little too sweet for my taste. I ended up just adding a little more seltzer water to cut some of the sweetness, which ended up making the drink perfect for me. 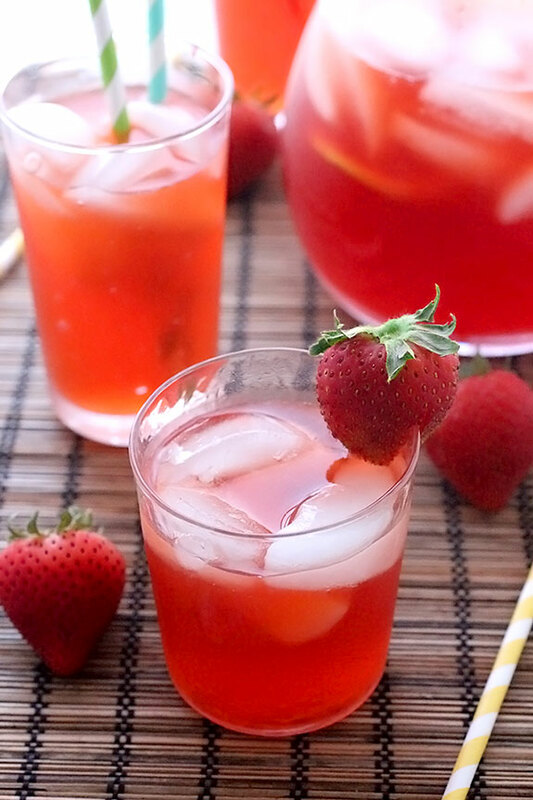 If you find the drink too sweet, you can simply add more seltzer or regular water, or even just add less of the strawberry syrup. This iced tea lemonade recipe is flexible enough that you can modify it to suit your tastes, and also change the flavors as you like. I think an orange or blueberry version of this iced tea lemonade would be delicious as well. No matter what fruit you decide to use, this is a drink recipe that should definitely make an appearance at your next summer barbecue. Enjoy! Begin by preparing the strawberry syrup. In a small saucepan set over medium heat, combine the water and sugar, and stir. Heat until the sugar dissolves. 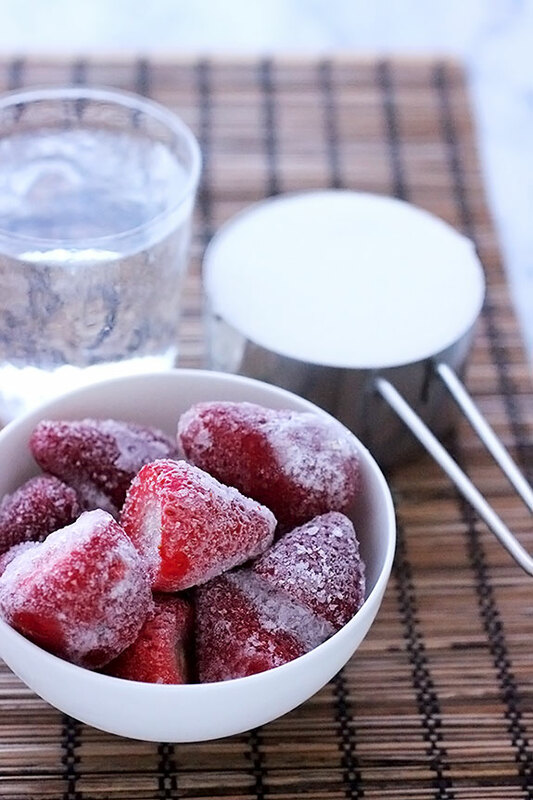 Once the sugar has dissolved, add the frozen strawberries to the saucepan. Simmer the strawberries and sugar mixture on low heat until the strawberries become very soft and the syrup has thickened, about ten minutes.Strain the syrup into a glass measuring cup, and discard the strawberries. 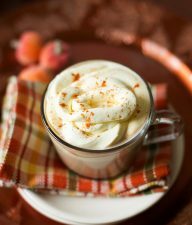 Allow the syrup to cool at room temperature for a few minutes, and then place it in the refrigerator to chill completely. As the syrup cools, prepare the tea. Add the three tea bags to the 2 cups of boiling water, and allow the tea to steep for about 30 minutes. Remove the tea bags and discard. 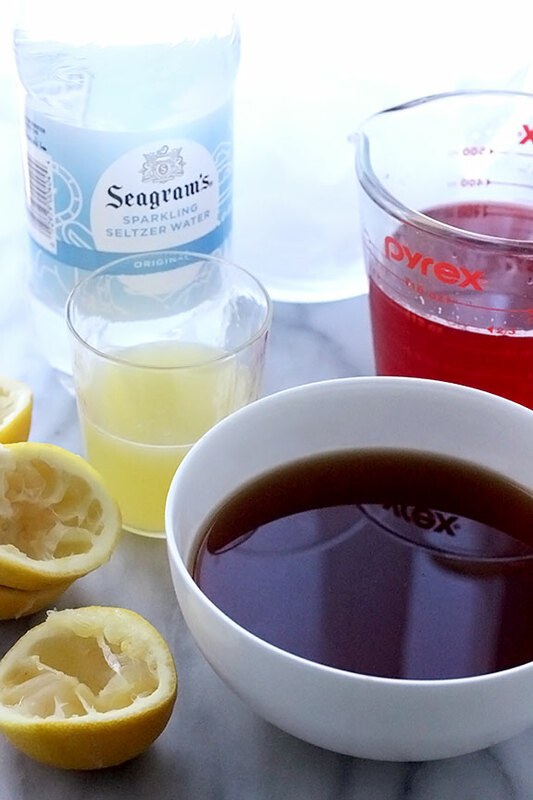 Chill the tea until ready to prepare the iced tea lemonade. Fill a large pitcher with ice. 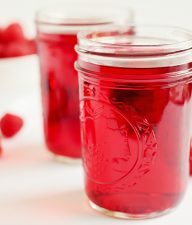 In a large bowl, stir together the strawberry syrup, the chilled tea, lemon juice, and seltzer. If you find the drink too sweet, add more seltzer water or regular water until the drink is sweet enough for your taste. Pour the iced tea lemonade into the pitcher with ice. Add a few thin slices of lemon to the pitcher. 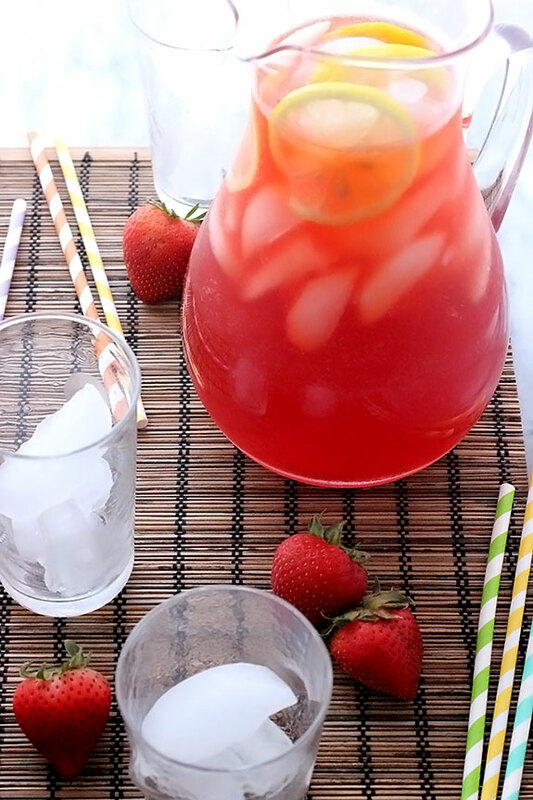 Serve the iced tea lemonade over ice and garnish with strawberries and additional lemon slices. Enjoy! Is this for a regular 2 quart pitcher? 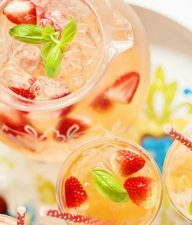 Can’t wait to try the recipe, I love Iced Teas but never tried a strawberry one. 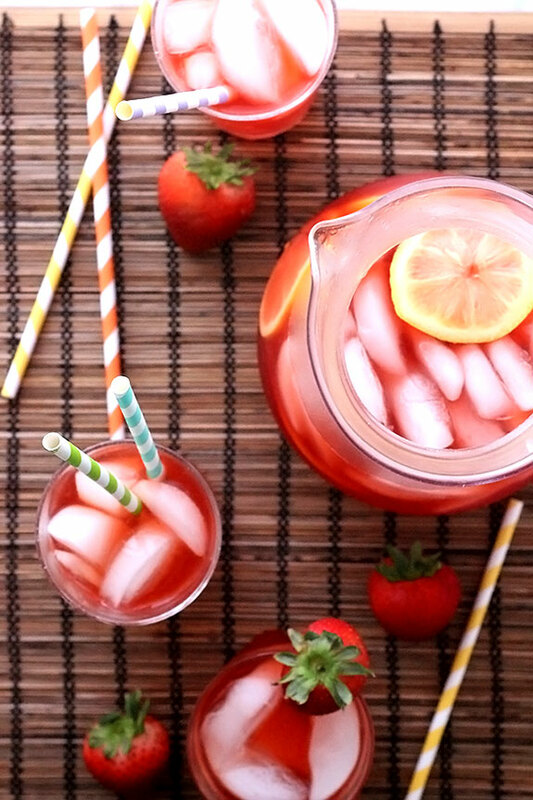 This is the perfect iced tea for summer. Love the flavors! !